The countries with the lowest infection rates were generally European, with the Scandinavian countries having the lowest percentages of infections. The total number of phishing sites observed in the second quarter of 2016 was 466,065. This was an all-time high. 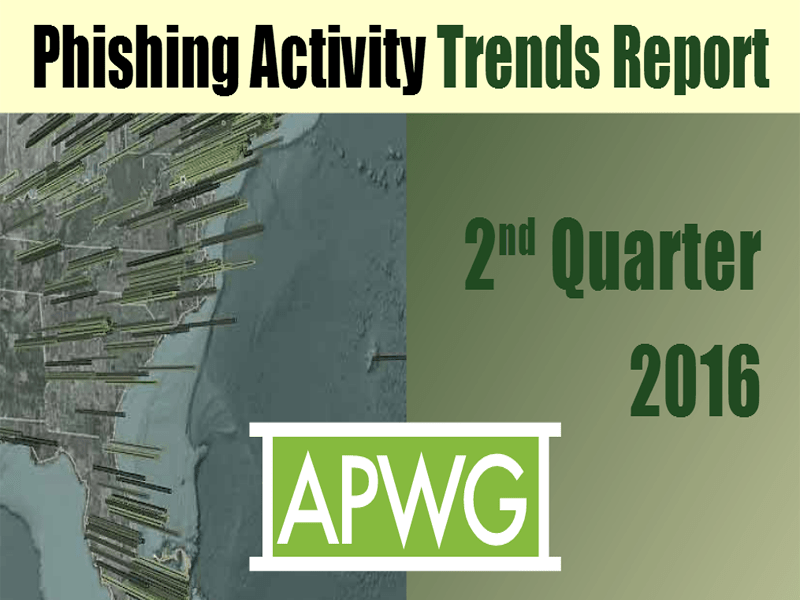 The second quarter’s total was up 61% from 289,371 phish found in the first quarter of 2016, which was the previous high. 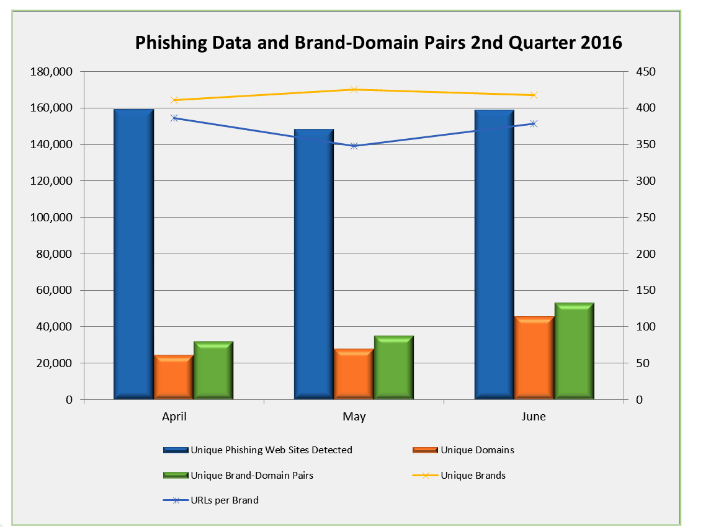 The Q2 total was almost three time the 158,574 phishing websites found in Q4 2015. Brand-Domain pairs are where the phishing website is hosted on a specifically registered domain name is shown in the below APWG chart. Brand/domain pairs count the unique instances of a domain being used to target a specific brand. Many phishing URLs may be hosted on this domain name to target the same brand. Phishing technologies such as browser blocking require the entire URL to prevent over blocking so it is useful to understand the general number of unique URLs that occur on each domain. The number of brands targeted by phishers in the second quarter remained consistent – ranging from 411 to 425 brands each month. 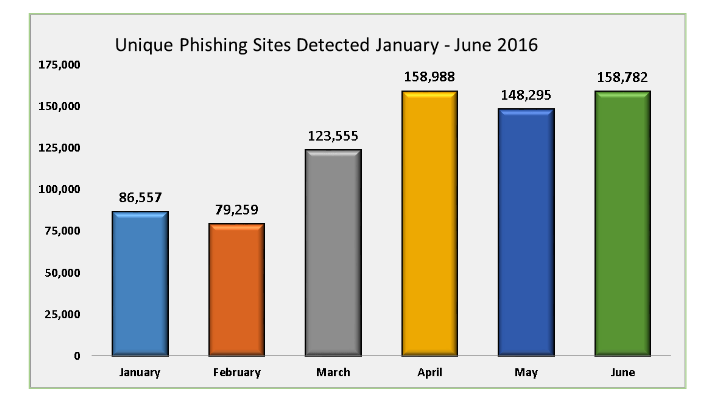 Across 2015 and through the first half of 2016, phishers targeted between 393 and 442 unique brands in any given month. The Retail/Service sector was the most-targeted industry sector during the second quarter of 2016, as it also was in the first quarter of the year. About 43 percent of phishing attacks targeted the Retail/Service sector. 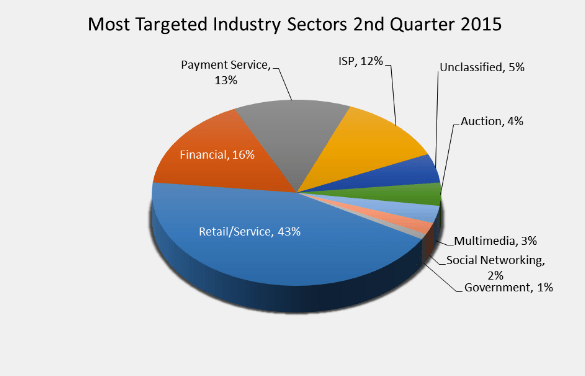 The Financial Services and Payment Services sectors were second and third, suffering an additional 16 percent and 13 percent of attacks respectively.